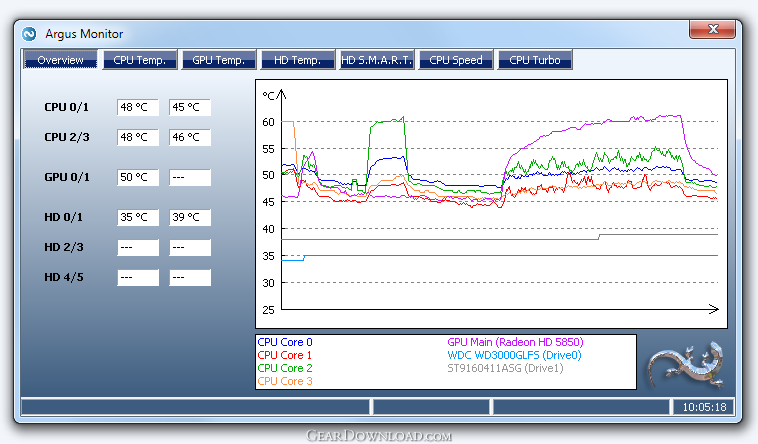 Monitoring temperatures and status of system components such as CPU, GPU and hard disk drive. Monitor your hard disk drive temperature and the health status of your hard disk drive by constantly checking the critical S.M.A.R.T. attributes. Warns you with a probability of up to 70 percent before a hard drive fails -- in time for you to save all the precious data added to your system after the last backup. Graphical display of the temperatures of your hard disk drives. Graphical display of the CPU temperature (independently for each CPU core). This download (ArgusMonitor_Setup.exe) was tested thoroughly and was found 100% clean. Click "Report Spyware" link on the top if you found this software contains any form of malware, including but not limited to: spyware, viruses, trojans and backdoors. Advanced-Password-Manager 3.0 - Advance Password Manager is a safe & user friendly password management utility. Odbc 4 All 2.3 - Easy connection to ODBC data sources for any application, DOS and scripts too ! Antechinus eBook Wizard 3.2 - Use eBook Wizard to compile your highly-compressed eBooks easily and in no time. Unusual Works Utility Pack 1.0 - CD Ejector and Note Manager programs. 1-abc.net Surf Trail Washer 7.00 - Tool to delete your internet trail (files, cookies, history, URLs) permanently!